The Studio at Contemporary Craft has a Drop In Studio activity, it’s theme bringing the current gallery exhibition into the hands of the public. 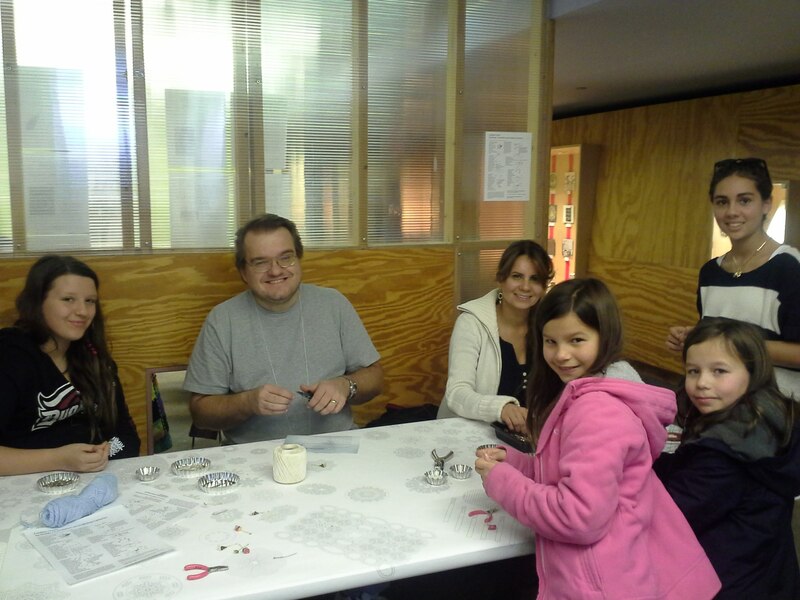 Visitors get the chance to make their own craft in a short period of time, and for those that aren’t routinely exposed to the arts the Drop In acts as a translation device. The current activity was designed by Melissa Cameron, and it’s absolutely my favorite to date. Melissa really went all out, sending her own examples to display and creating a table covering that features designs that she uses in her work. She typically takes an old object- a metal tin, bamboo plate or vintage steel coaster- and transforms it into a pair of objects, giving them new forms and functions. 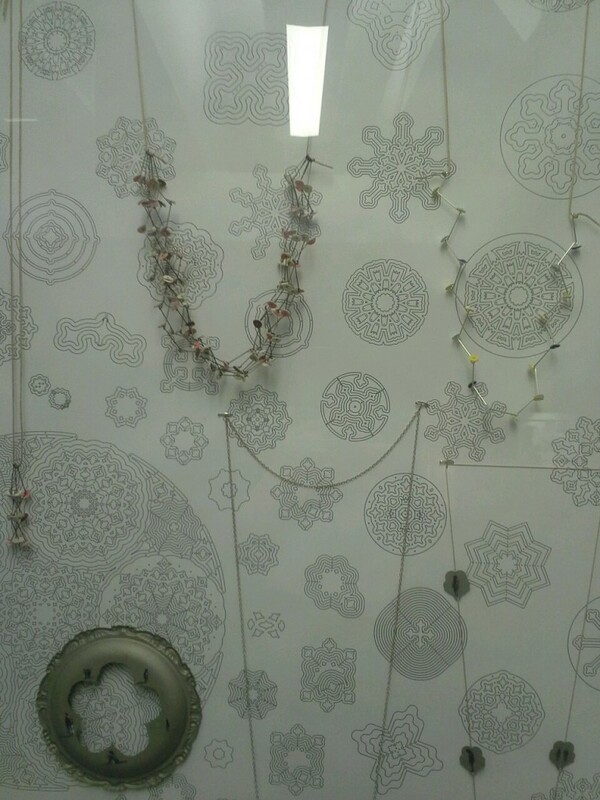 The patterns she meticulously saw pierces are based on mathematical equations, some reminiscent of snow flakes, so the Drop In area looks particularly festive. This activity uses old paint samples (the same kind my sister and I would pilfer from hardware stores when we were kids) and hole punches to make colored confetti. Put the confetti on headpins, connect them end to end or on groupings to create endless combinations. I feel a personal connection to this activity, I grew up doing this (and stealing hardware store paint chips) and I remember how cool it was to initially get tools in my hands. How cute are these two families that were in the Drop In Studio on a Saturday afternoon? They got to learn a new skill and really make good use of their visit to Contemporary Craft. And what a cool dad, I bet he doesn’t always use pink and purple pliers!